Today’s interview is with Niessa Meier, Certified Nurse Midwife, and wonderful patient advocate. She has been a part of five family centered c-sections to date. Niessa is a dream come true for OB care. Here is her story! LOVE! I was so excited about it. I had felt that we needed to do something more for cesarean moms for a while, but this video gave me the “what” and the “how”. Talking with my dear friend Mindy about the births of her children : ) Actually, I had felt for a while that we were making such progress in vaginal birth, We’ve worked hard on that for the past 8 or 9 years . . . cesarean moms seemed left behind. The first step was moving the “recovery” period to the women’s services unit instead of the PACU. This allowed moms to see and hold their babies as soon as they were out of surgery. Once I saw the family centered cesarean video, it just made sense that this was the next step. I am convinced that God prepared us. This was brought to us at a time when we had been prepared as a group, and individually our hearts were ready for the next step. Convincing everyone to give it a try! There are actually some logistical challenges in keeping the surgical site sterile. The next step for me is creating a “menu” of cesarean options just like we have for vaginal birth. Not every mom wants to see the baby coming out. Not everyone wants to touch a wet baby. The whole point is that this event is tailored for this woman and this family, that’s what truly makes it family centered. Everyone should have their choice of the available options, and should be able to celebrate the birth of their child. The labor and delivery nurses, pediatricians and anesthesia providers have really had to change their routine the most. The nurses now do all of their assessments and medications while the baby is in moms arms. The nurses also have to stay really close to mom and baby, since mom can be feeling weak or nauseas and may need help supporting the baby. The pediatricians are now doing a preliminary assessment while the baby is resting on mom, and then performing a full assessment later in the hospital stay. The biggest change for me has been the lowering of the drape that allows the parents to view the birth. Once the drape is lowered a sterile baby blanket is placed over the drape. Once the baby is born, we can place the baby on the blanket, the nurses can then pull the baby up to moms chest, keeping our side sterile. Then the drape can be lifted again so the parents don’t have to watch the end of the surgery, and to keep things sterile. I wish we could leave the drape down so I could see the new parents cuddling their baby, but I miss out on that part! There is definitely less medication required during surgery, which is a really big deal to me. I have also noticed that the families feel that they have “experienced” birth. A repeat cesarean section is a routine procedure for us . . . but it should never feel like just a surgery to the parents. The emotional impact is huge. I suspect that we will see less postpartum depression and breastfeeding difficulties, but I don’t have enough data to say that for sure. How did it feel to watch the reaction of your patient during the family centered csection? Amazing. We all had tears in our eyes. The unit talked about it all day. It is also amazing to show the video to moms who are planning a cesarean birth. They are so amazed and excited. What surprised you most about the family centered c-section? How much it meant to all of the staff. I knew I would be moved by it, I knew I would love it, but I was nervous. If it was a disaster, we might never get the chance to try it again. It was such a relief to see everyone having a great time. Also, all of the energy in the room was focused on the family–just like it should be. How would you describe the atmosphere in the OR during a regular c-section? We say “hi” to the patient when we walk in, we try to talk to her periodically through the surgery, but we can’t see her. It inevitably becomes a procedure. We work through the layers, while talking about the same kinds of things we might talk about while having lunch, or any other time. The atmosphere is not tense–its just routine. There is no focus on the parents or on the baby until the baby is born, and then the focus only remains on the baby for a few minutes before he is taken to the nursery. 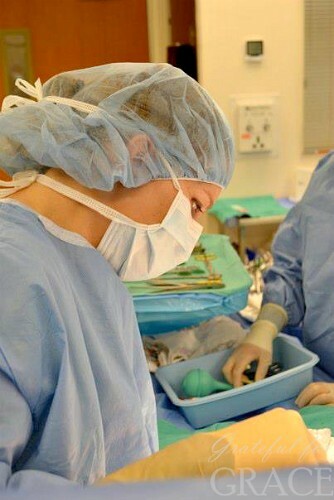 How would you describe the atmosphere in the OR during a family centered csection? The excitement of the parents is palpable, and contagious. Watching her see her baby for the first time is wonderful, and all eyes are on mom and baby. We have even had the anesthesia providers act as photographers on occasion! When I am talking to other providers I speak first about the rewards that we get from being part of such an awesome experience. Next, I remind them that women are very savvy consumers. Someone is going to provide this service, and women will take their business to them. When providers are reluctant to do something that is clearly better for women, it makes me question their philosophy of birth. Is all birth just a procedure for them? It has made me look forward to c-sections! I love talking to families before the surgery, reassuring them, and then seeing the joy on their faces when their baby is born. Every birth adds a new member to a family, and should be celebrated. Protecting that celebration is a big part of my job, and one that I can do much better now through the family centered cesarean. Please feel free to share any personal stories or comments you would like. A sweet patient who had a difficult experience with her first birth, which ended in a very stressful cesarean birth, is driving from Houston to Kerrville to have a family centered cesarean. Another family whose son has a terrible illness struggled with the stress of chemotherapy and traveling long distances for treatments while pregnant with another child. It was hard for them to face the prospect of losing one child and “replacing” him with another. The looks on their faces when they met their daughter were beautiful, and being able to hold her in their arms throughout the surgery was so sweet. I am also excited to have a patient who is having twins and we are providing a family centered c-section, so that will be our first FCC of twins! Isn’t this just amazing? I weep every time I hear another side of this beautiful option for mothers. If you would like a family centered c-section, why not send your doctor the link for this post and the others in the series, or print them out for her! Helping her hear medical professionals’ sides could go a long way! Also… get ready to buy my eBook! Make the Most of Your C-Section: Tips from a C-Section Mom of 6 will be released very soon!